This was actually not the first time I saw him live. I think it was about two years ago. Ada in my cell group works in Cisco and they held their 50(?) year anniversary event – Santana ft. Five for Fighting – at HP Pavalion. Ada’s husband couldn’t go so she invited me to go with her. It was my very first California concert. A couple of months a go, Radio Alice played his new song “The Riddle”, and I fell in love with the song instantly. It was incredibly beautiful. Therefore, I dug up his new album “Two Lights” and loved it! I have to say, I love small venue. I’ve been to HP Pavalion a couple of times and I can hardly see anything. You can really feel the energy and closeness in a small venue like GAMH or Slim’s. Sometimes you’d even have eye contacts with the performers! This evening, we managed to obtained a space around 3 meters away from the stage. It’s not ideal (we got to the second “row” one time at Snow Patrol concert and it was awesome!) but good enough. There were a lot of old people and some teenagers, we didn’t want to be too aggressive. 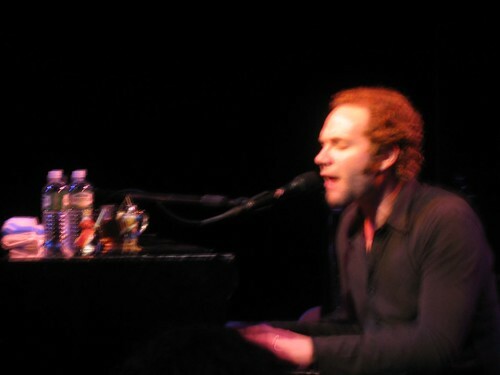 Although I’ve listened to “Two Lights” and “American Town”, the impression I have for John Ondrasik (AKA Five for Fighting) was still the quiet guy who sings ballad melody songs while playing a piano. But he turned out to be way more energetic and fun than I expected! His voice was more affective live and I enjoyed almost every song he sang. (Except the one that was dedicated for 15-year-olds. Guess I’ve passed that age…) He was also charming despite his looks (lol). I love that he had good interaction with us, told us stories and all. And I love that he loves us for being such wonderful audiences who kept silent while he sang and party like crazy when he asked us to join him. It was really awesome. check out the vidoes I took!